For other uses, see Golden Horn (disambiguation). Map of Istanbul's Historic Peninsula (lower left), showing the location of the Golden Horn and Sarayburnu (Seraglio Point) in relation to Bosphorus strait, as well as historically significant sites (black), and various notable neighborhoods. The Golden Horn (Turkish: Altın Boynuz; Ancient Greek: Χρυσόκερας, Chrysókeras; Latin: Sinus Ceratinus), also known by its modern Turkish name, Haliç ([haɫitʃ]), is a major urban waterway and the primary inlet of the Bosphorus in Istanbul, Turkey. As a natural estuary that joins Bosphorus Strait at the point where the strait meets the Sea of Marmara, the waters of the Golden Horn help define the northern boundary of the peninsula constituting "Old Istanbul" (ancient Byzantium and Constantinople), the tip of which is the promontory of Sarayburnu, or Seraglio Point. This estuarial inlet geographically separates the historic center of Istanbul from the rest of the city, and forms a horn-shaped, sheltered harbor that has historically protected Greek, Roman, Byzantine, Ottoman and other maritime trade ships for thousands of years. While the reference to a "horn" is understood to refer to the inlet's aerial silhouette, the significance of the designation "golden" is more obscure, with historians believing it to refer to either the riches brought into the city through the bustling historic harbor located along its shores, or to romantic artistic interpretations of the rich yellow light blazing upon the estuary's waters as the sun sets over the city. Its Greek and English names mean the same, while its Turkish name, Haliç, simply means "estuary", and is derived from the Arabic word khaleej, meaning "gulf". 1860-70 German map of Ottoman-era Istanbul, showing the Golden Horn (Sector B2) and its source rivers, Alibeyköy and Kağıthane. Eski Galata Bridge (literally, Old Galata Bridge), now-defunct, which used to connect the downstream neighborhoods of Karaköy and Eminönü, but was disassembled and relocated upstream between Ayvansaray and Keçeci Piri following extensive damage in 1992 caused by a fire originating in the kitchen of one of the restaurants located on the bridge's lower level. Originally dating back to 1912, the now-retired structure is no longer used for vehicular or pedestrian traffic, but functions as a seasonal outdoor exhibit and event space attached to Haliç Park. 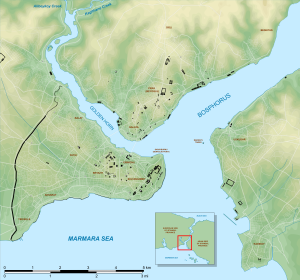 The Byzantine Empire had its naval headquarters there, and walls were built along the shoreline to protect the city of Constantinople from naval attacks. At the entrance to the Horn on the northern side, a large chain was pulled across from Constantinople to the old Tower of Galata to prevent unwanted ships from entering. Known among the Byzantines as the Megàlos Pyrgos (meaning "Great Tower" in Greek), this tower was largely destroyed by the Latin Crusaders during the Fourth Crusade in 1204. In 1348, the Genoese built a new tower nearby which they called Christea Turris (Tower of Christ), now called Galata Tower. There were three notable times when the chain across the Horn was either broken or circumvented. In the 10th century the Kievan Rus' dragged their longships out of the Bosphorus, around Galata, and relaunched them in the Horn; the Byzantines defeated them with Greek fire. In 1204, during the Fourth Crusade, Venetian ships were able to break the chain with a ram. 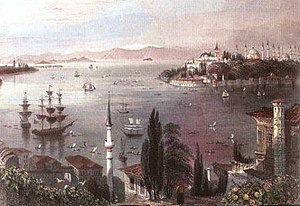 In 1453, Ottoman Sultan Mehmed II, having failed in his attempt to break the chain with brute force, instead used the same tactic as the Rus'; towing his ships across Galata over greased logs and into the estuary. After the Ottoman conquest of Constantinople in 1453, Mehmed II resettled ethnic Greeks along the Horn in the Phanar (today's Fener). Balat continued to be inhabited by Jews, as during the Byzantine age, though many Jews decided to leave following the takeover of the city. This area was repopulated when Bayezid II invited the Jews who were expelled from Spain to resettle in Balat. In 1502, Leonardo da Vinci produced a drawing of a single-span 240-metre (790 ft) bridge over the Golden Horn as part of a civil engineering project for Sultan Bayezid II. Leonardo's drawings and notes regarding this bridge are currently displayed at the Museo della Scienza e della Tecnologia in Milan, Italy. While the original design was never executed, the vision of Leonardo's Golden Horn Bridge was resurrected in 2001, when a small footbridge based on Leonardo's design was constructed near Ås in Norway by Vebjørn Sand. Nowadays, the Golden Horn is settled on both sides, and there are parks along each shore. The Istanbul Chamber of Commerce is also located along the shore, as are several Muslim, Jewish and Christian cemeteries. Other institutions along the Horn's banks include museums, congress and cultural halls, supporting facilities of the Turkish Navy, and campuses of various universities. Today, the Horn's history and natural environment make it a popular tourist attraction in Istanbul, visited by 10 million international vacationers annually. The Golden Horn is featured in many works of literature dealing with classical themes. For example, G. K. Chesterton's poem Lepanto contains the memorable couplet "From evening isles fantastical rings faint the Spanish gun, / And the Lord upon the Golden Horn is laughing in the sun." The first bridge on the Horn, built by Byzantine Emperor Justinian the Great, can be seen near the Theodosian Walls at the western end of the city (see upper right) in this rendering of old Constantinople. Ivan Constantinovich Aivazovsky's "Dusk on the Golden Horn", depicting the estuary's trademark golden lights. The entrance to the Horn is in the foreground, with the Historic Peninsula (left), and Galata (right). Another painting by Aivazovsky, titled "View of Constantinople by Evening Light", depicting the Horn as seen from a hilltop near Kasımpaşa. Visible in the background are the Galata Tower, the entrance to the Horn, and Seraglio Point. Boats on the Golden Horn, with Süleymaniye Mosque atop the city's Third Hill in the background. Vantage point for this painting is likely around Karaköy. Similar view of Süleymaniye Mosque by Tristram Ellis, from the late 19th century. 1838 View of the Golden Horn from the hills of Okmeydanı - the imperial archery practice fields of the Ottoman Army. The Horn as seen from the hills of Eyüp in the 1890s, looking toward Sütlüce in the foreground, and the Old City in the distance. The Golden Horn, looking from upstream to downstream (i.e. from northwest to southeast), toward the Bosphorus. Looking downstream from Pierre Loti Hill in Eyüp toward Sütlüce (foreground, opposite shore), the Haliç Bridge (midground), and the entrance to the Golden Horn (far background). Looking upstream from Seraglio Point in 2006. Galata, Atatürk, and Haliç bridges are seen from closest to farthest. The Golden Horn Metro Bridge, presently positioned between the first two bridges, was completed eight years after this photograph, and is thus not visible. The entrance to the Golden Horn and Seraglio Point (at the very tip of the Historic Peninsula, at far left), as seen from Galata Tower, 2006. View of Karaköy (foreground) and Galata Tower (background) from Eminönü in 2005. Süleymaniye Mosque from Karaköy, 2006. Golden Horn Bridge designed by Leonardo da Vinci in 1502. Wooden model corresponding to Leonardo da Vinci's bridge design. ^ a b BBC: "Istanbul's ancient past unearthed" Published on 10 January 2007. Retrieved on 3 March 2010. Wikivoyage has a travel guide for Istanbul/Golden Horn. Wikimedia Commons has media related to Golden Horn.